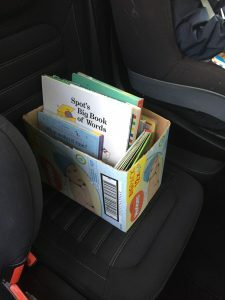 The car book box is something we have been doing for the last year or so…and it’s been such a success! I used a spare box that would otherwise have just been recycled, and put some books in it – ones generally that were big, with pictures, or flaps, and with numbers, letters, shapes, animals, diggers, dinosaurs, weather etc. Both the boys absolutely love it, especially my 2yo. As soon as we get in the car, he starts choosing which book he wants. And they sit there discussing the contents, practicing numbers, letters, foods etc (but at their own volition, not mine!) – their vocabulary and knowledge has increased no end, and car journeys are pretty easy with them! 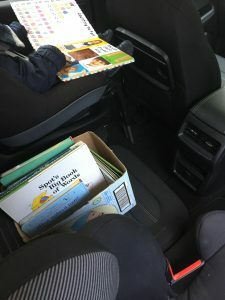 They say the more kids read the better, right…so books live everywhere in our house, and even in our car! Next story Shaving foam and food colouring messy play! Previous story Easy microwaveable salt dough lego men and rockets!